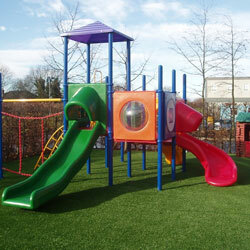 TigerTurf is the UK’s largest dedicated manufacturer of artificial (synthetic) turf. Based in the West Midlands TigerTurf utilises a skilled local work force that manufactures the latest and most realistic artificial grass. Established in 1984 TigerTurf have built a reputation in the UK as the market leader for synthetic turf within the sports market. Whether you’re using your local community 5-a-side pitch or visiting the head quarters of the RFU, WRU, IRU and the FA there’s a good chance its TigerTurf you’re playing on. Utilising our years of experience and expertise in manufacturing synthetic turf we are able offer two unique benefits when you buy TigerTurf. Source the best quality materials.